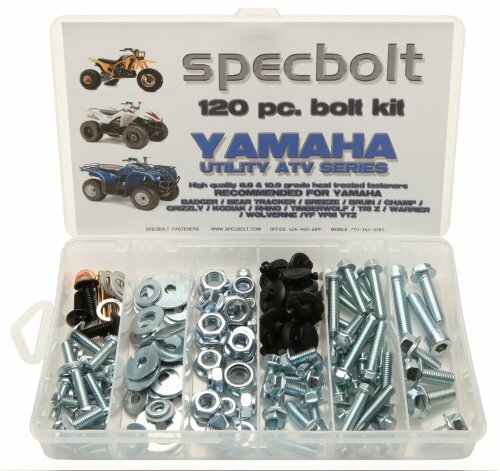 This Specbolt 120 piece kit will save you many trips to the dealership for that special OEM fastener needed for your Yamaha Utility ATV. Fits all BADGER 80, BEAR TRACKER 230 250, BREEZE 124 125, BRUIN 230 250 350, CHAMP 110, GRIZZLY 80 125 600 660, KODIAK & KODIAK BEAR 400 401 421, RHINO 421 660, TIMBER-WOLF 229 230 250, ALL TRI-Z & TRI MOTO, WARRIOR 350, WOLVERINE 350 450, YF 60, YFM 80 200 250 350, & YTZ 250 AND MORE! Your Bolt Kit will include just the right amount of factory match flange bolts, flange nuts, lock nuts, sealing washers, fender washers, plastic push rivets, wide head Phillips screws, and more. Most everything you need to perform basic maintenance and upkeep to your Quad. Assortment of commonly needed bolts for plastic, fenders, bodywork, engine, frame, seat, fuel tank, controls, carburetor, exhaust, pipe, silencer, radiators, handlebars, swing arm components, skid plates, bumpers and more. These fasteners meet or exceed quality standards of your machine's originals. A perfect addition to the hunter's or farmer's tool kit and a must have for the do-it-yourself mechanics. 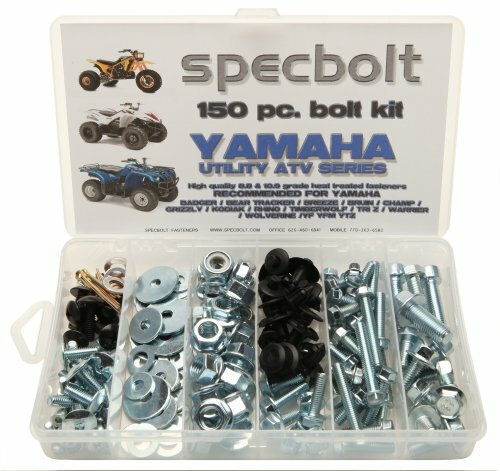 This Specbolt 150 piece kit will save you many trips to the dealership for that special OEM fastener needed for your Yamaha Utility ATV. Fits all BADGER 80, BEAR TRACKER 230 250, BREEZE 124 125, BRUIN 230 250 350, CHAMP 110, GRIZZLY 80 125 600 660, KODIAK & KODIAK BEAR 400 401 421, RHINO 421 660, TIMBER-WOLF 229 230 250, ALL TRI-Z & TRI MOTO, WARRIOR 350, WOLVERINE 350 450, YF 60, YFM 80 200 250 350, & YTZ 250 AND MORE! Your Bolt Kit will include just the right amount of factory match flange bolts, full set of lug nuts, flange nuts, lock nuts, sealing washers, fender washers, plastic push rivets, wide head Phillips screws, cotter pins, and more. Most everything you need to perform basic maintenance and upkeep to your Quad. 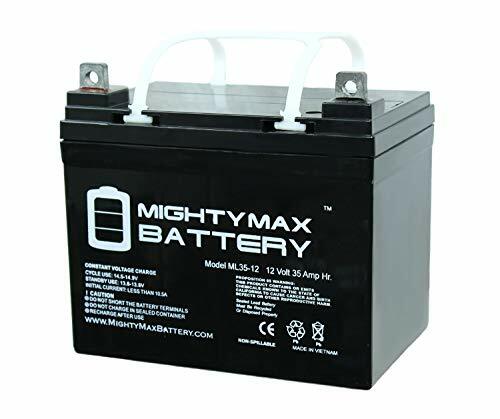 Assortment of commonly needed bolts for plastic, fenders, bodywork, engine, frame, seat, fuel tank, controls, carburetor, exhaust, pipe, silencer, radiators, handlebars, swing arm components, skid plates, bumpers and more. These fasteners meet or exceed quality standards of your machine's originals. A perfect addition to the hunter's or farmer's tool kit and a must have for the do-it-yourself mechanics. 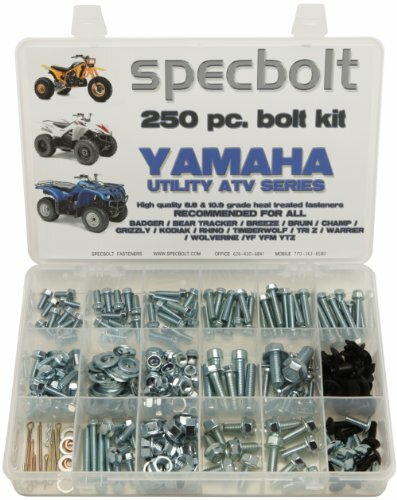 This Specbolt 150 piece kit will save you many trips to the dealership for that special OEM fastener needed for your Yamaha Utility ATV. Fits all BADGER 80, BEAR TRACKER 230 250, BREEZE 124 125, BRUIN 230 250 350, CHAMP 110, GRIZZLY 80 125 600 660, KODIAK & KODIAK BEAR 400 401 421, RHINO 421 660, TIMBER-WOLF 229 230 250, ALL TRI-Z & TRI MOTO, WARRIOR 350, WOLVERINE 350 450, YF 60, YFM 80 200 250 350, & YTZ 250 AND MORE! Your Bolt Kit will include just the right amount of factory match flange bolts, full set of lug nuts, flange nuts, lock nuts, sealing washers, fender washers, plastic push rivets, wide head Phillips screws, cotter pins, and more. Most everything you need to perform basic maintenance and upkeep to your Quad. Assortment of commonly needed bolts for plastic, fenders, footpeg, bodywork, engine, frame, seat, fuel tank, controls, carburetor bowl, exhaust, pipe, silencer, radiators, handlebars, swing arm components, skid plates, bumpers and more. These fasteners meet or exceed quality standards of your machine's originals. A perfect addition to the hunter's or farmer's tool kit and a must have for the do-it-yourself mechanics. Rhino-Racking’s dynamic industrial storage units are designed for a range of customers. 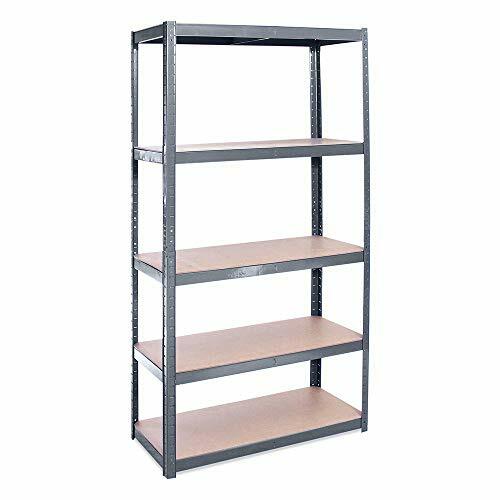 Not only are they easy to assemble without the need for any bolts or screws, they are built from the most durable materials providing you with a solid, long lasting storage unit. RhinoGear's sturdy, durable RhinoRamps allow for reliable and convenient access to the underside of your vehicle. Patented polymer internal support system and wide stance offer excellent weight distribution and unbeatable strength. 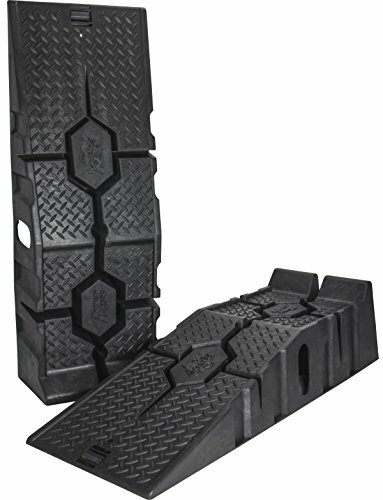 The innovative CoreTRAC non-skid base helps reduce slippage while the 17 degree incline provides easy use for low clearance vehicles. These portable automotive ramps are great for cars, trucks, pickups, sport utility vehicles, and vans. 12K RhinoRamps patented structural design combined with heavy duty resin material makes them "strong as steel". RhipGear's sturdy, durable RhinoRamps allow for reliable and convenient access to the underside of your vehicle. Patented polymer internal support system and wide stance offer excellent weight distribution and unbeatable strength. 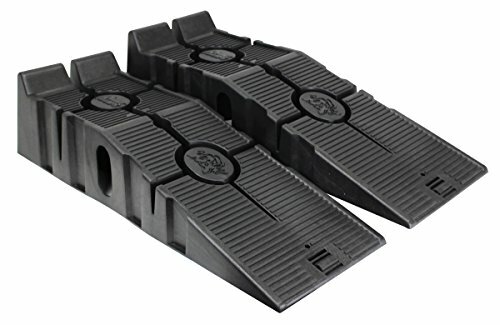 The innovative CoreTRAC non-skid base helps reduce slippage while the 17 degree incline provides easy use for low clearance vehicles. These portable automotive ramps are great for cars, pick-ups, sport utility vehicles, and vans. Killer mtorsports out testing out the new UTV hisun side by side. Play riding, having fun mudding. We put these to the ultmate test when deciding if it was something we wanted to sell. Visit our website at www.killermotorsports.com to buy new products or to get more help or parts!! Want more Rhino Utility Vehicle similar ideas? Try to explore these searches: Safety Funnel, Empire Small Escutcheon, and 80a Level.